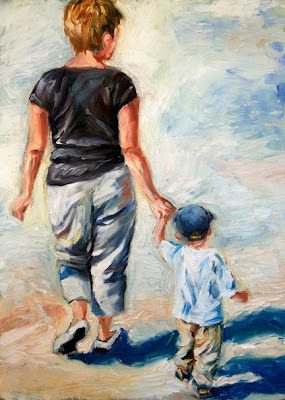 These are 2 paintings I did of my sister and her grandson for her big 60 birthday. The larger one I did first as a quicker study, and it came out looser and a little more spontaneous than the smaller. That was the more finished one. But as is often the case, when you hold yourself to no restrictions, things seem to come out better. It is a depiction of a precious time between 2 special people, something they will enjoy remembering for years to come. I think I like the larger one better. The viewer knows that it is a wonderful warm moment between the two people and there is something intriguing about not knowing the whole scene. The people are the focus..and could be at the beach or anywhere. I like the looser quality as well. P.S. Congratulations on getting into the Carol Marine workshop! I really think this is the best way to start discovering where you want to be artistically. When we discover how we approach a painting i.e. what color we coat the canvas with, what brushes we use, what color palette...that's when our work starts to define itself. I've just ordered a book by Richard Schmid. 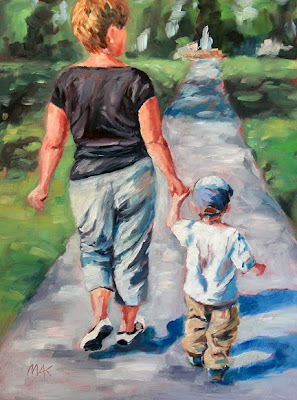 I love his style and approach to painting in oils. I guess a book is the next best thing to a workshop! I'm sure your sister was delighted with these!